Our Stories of Migration details human movement through art objects and storytelling. 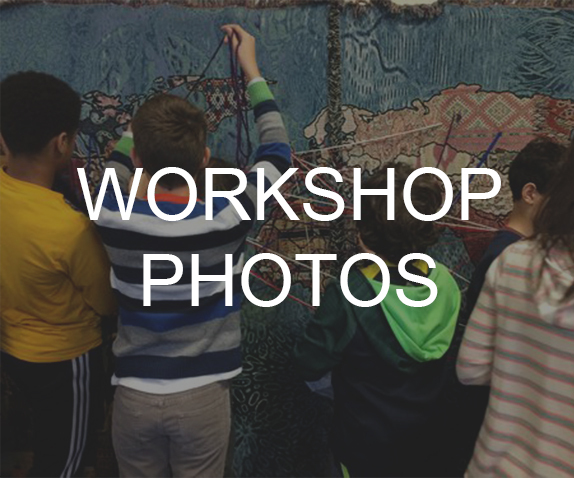 Participants are invited to embroider their own ancestral, present, and future paths onto the surface of a world map tapestry, which has been constructed with digital images mined from the site-specific museum collections. Each image highlights a different object from the collection that embodies historical moments of cultural exchange. Whether these exchanges take the form of material goods gathered from a trade route or culturally specific images taking on a new meaning in a different land - Our Stories of Migration encourages critical engagement through personal and cultural histories. Additionally, visitors draw their own maps - which are continuously added to an animated archive - and write responses to the prompt question: "What does it mean to be a global citizen?"